It was definitely the Dog Days of Summer, with the temperature hitting 95 degrees at the dock and the heat index registering 110° Fahrenheit. Oppressive is too kind a word to describe the heat onshore! 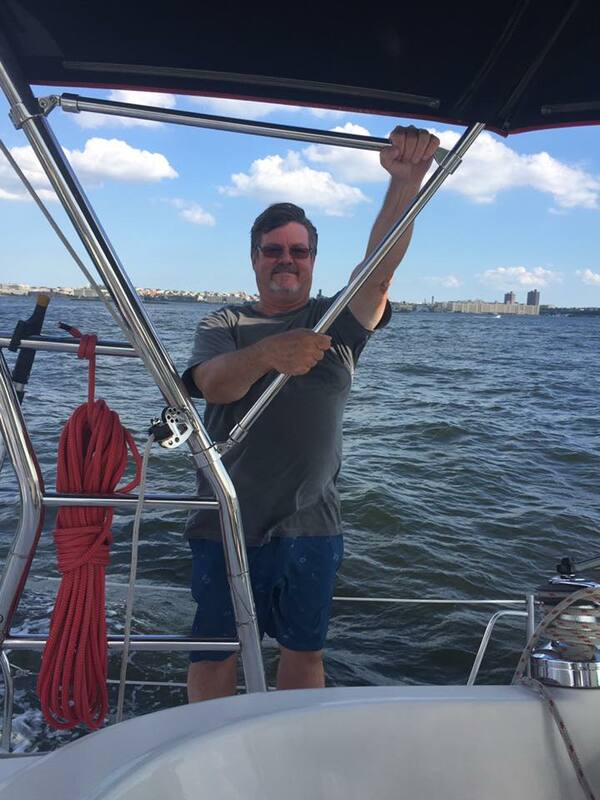 Fortunately, it was a different story out on the water. Despite the sweltering heat, there was a nice wind, and that helped to keep the racers relatively cool. A cooler full of ice-cold water was also a big help. 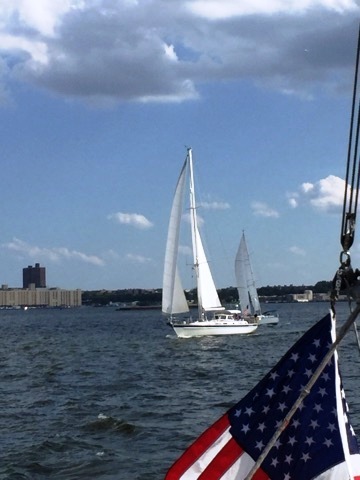 It was also a day when biminis on boats were much appreciated, even if they made trimming sails more of a challenge. On Sunday, August 14th, Osprey Maritime Services hosted the Dog Days of Summer Regatta. Kudos to Jim Chambers, Michelle and JP Purinton for putting on a great event. We would also like to thank Port Supply for graciously donating a handheld VHF radio as a prize for the winner on corrected time. The Regatta was a resounding success, with wind, sunny skies and a number of club members taking part! 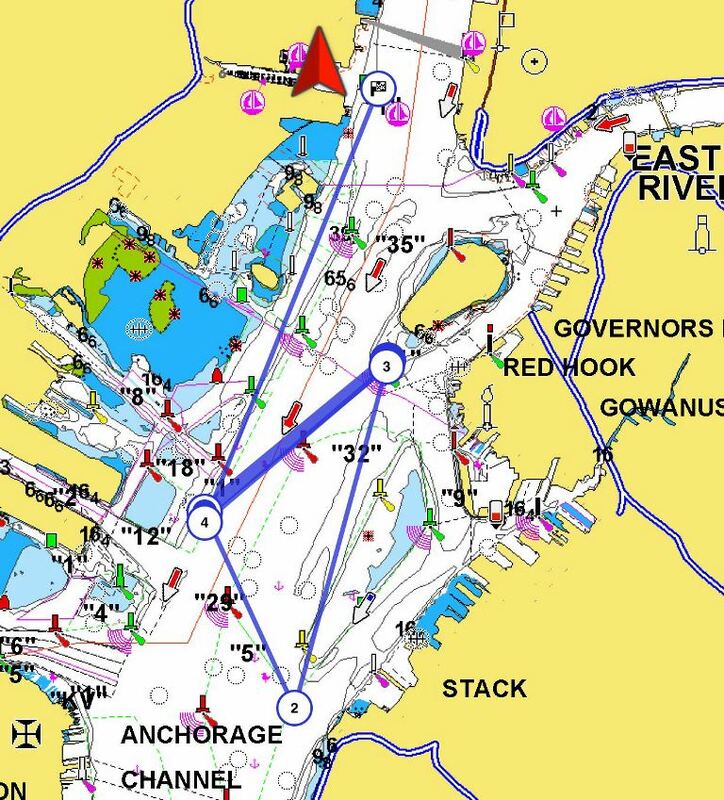 After reviewing the wind forecast, the race committee determined that with a west to southwest wind, the course would be set between green can “1” at the south end of Governor’s Island, green can “31” by Robbin’s Reef, green can “5” by Bay Ridge channel and back to “1”, then “31” before finishing off by the green can marking the entrance to Morris Canal. First across the start line was Jay Canty with Dauntless, closely followed by Steve Crane on Lucky. Heading into the wind, Dauntless kept the lead to the first mark, although Gadi Zofi’s Tenacious was nipping on her heels. Tenacious took the lead rounding the next two marks until Marc Kornutik on No Doubt grabbed the lead rounding the last mark, and carried it all the way to the finish line, taking well-deserved line honors. On corrected time, Dauntless placed first, with No Doubt in second and Tenacious a close third. We are planning several more races before the season ends in October, or if we have a mild fall, November. Maybe December…?